Vertical gardens are a bit of an in thing just now. Perhaps it started with Patrick Blanc and his artistic green wallscapes, or perhaps with the grass-roots pallet gardening movement, seeking ways to both recycle waste materials and create more gardening space… at any rate, the Colorbond fences and concrete walls of our cities have suddenly started to go green in the last few years. At our house, the motivation was more about aesthetics than about creating productive space (although who can resist having a bit more of that?). We had fenced in a bit of yard to have a private outdoor space and would have loved to grow something green over that great, imposing, glary fence that we now faced. 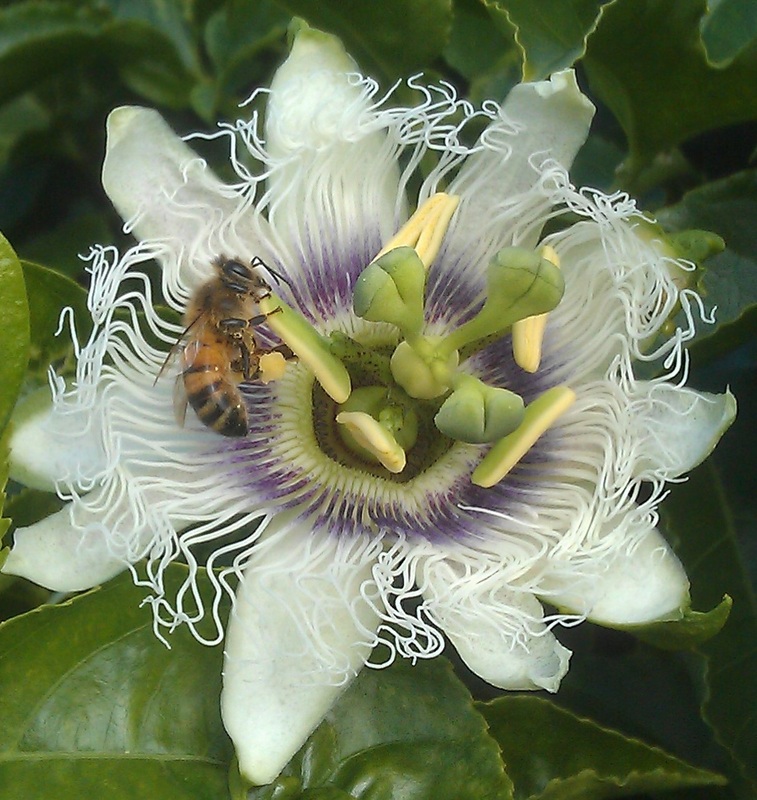 We planted passionfruit on the outside – that gave us fruit and effectively graffiti-proofed the fence. But the trouble was that we also had a sliding gate that ran inside the fence when it opened, preventing us from growing vines on this side. The solution we found was to erect a “green wall” just inside the fence, so the gate could disappear between fence and plants, giving us an uninterrupted garden view. Like many garden projects it was a case of trial and error. 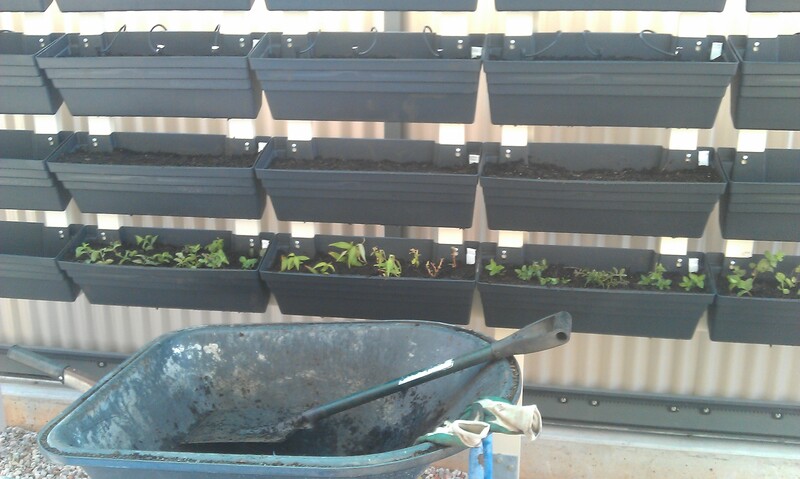 We started out by designing and building a customised metal frame to hold lots and lots of pots, with the intention of modifying the pots so that plants could grow out the side of them while being watered from above. This was fiddly, never entirely resolved, and eventually abandoned as the metal components started to rust before we even got the thing built! 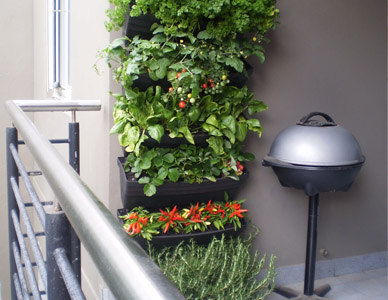 Meanwhile more and more DIY vertical garden options were coming onto the market, and we came across the Wallgarden system (above). Unlike felt-pocket systems, this offered a more conventional container growing approach, with a reasonable volume of growing medium per plant, the flexibility to rearrange units at will, and seemed less at risk of drying out quickly in our hot, dry summers. 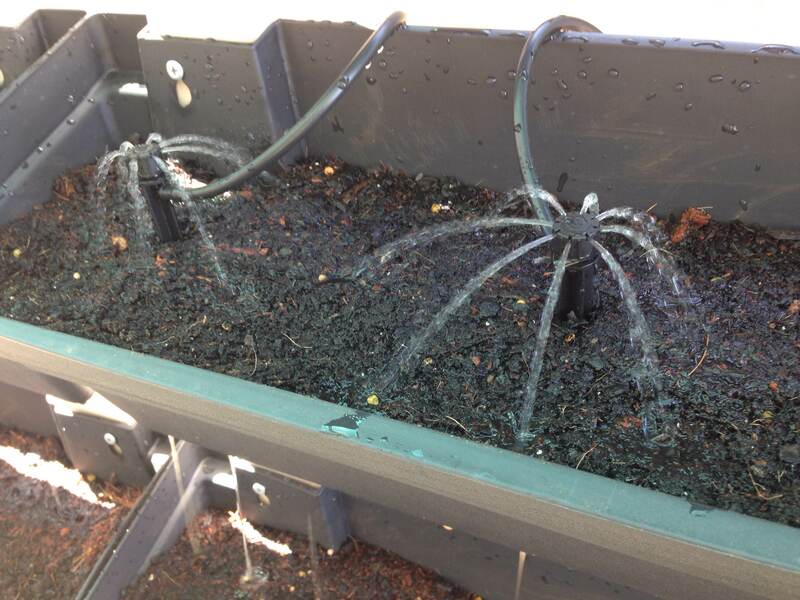 It was also simpler and more economical to set up than some systems that had built-in irrigation. It was made of recycled plastic. It was a whole lot quicker than a custom-built job so we might actually get it finished – and much easier to maintain than a pallet garden. It ticked all the boxes. 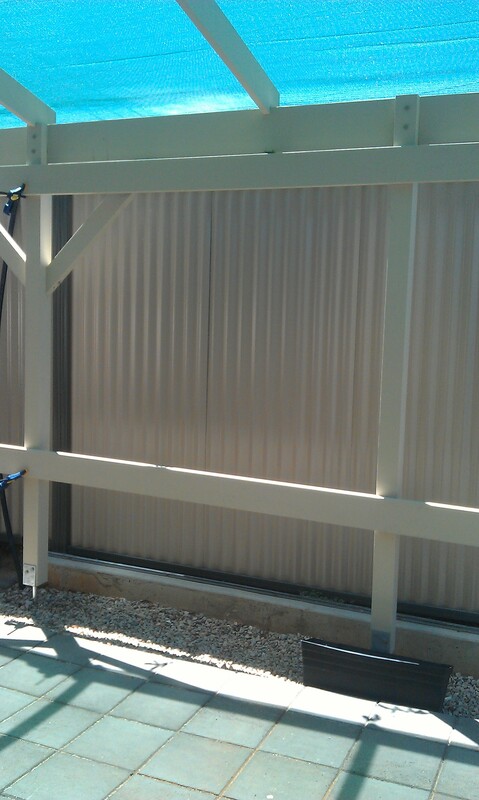 The Wallgarden can be installed on any structural (load-bearing) wall or fence, but in our case a new structure was required to screen off the wide gate as it slid open. We used this opportunity to extend our pergola to provide more shade to the eastern side of our house in summer. It has been temporarily covered with shadecloth for summer, until we get grapevines established over it to provide seasonal shading. The Wallgarden was installed between the posts of the eastern side of the pergola. It’s quite a large set-up, with 30 modules that provide about 4 1/2 square metres of screening, or 18 linear metres of growing space. Drip irrigation on an automatic timer waters the top pots and the water then trickles down to those below, then to the row of terracotta pots sitting on gravel underneath, and finally through to the roots of the passionfruit under the fence. Although we run the irrigation twice a day in warm weather to ensure it doesn’t dry out, it only takes two minutes each time and none of the water goes to waste. Originally we intended to make this “a bit of garden bling” – an ornamental feature in a largely edible garden – but my seed collection and existing plants got the better of me and I soon found myself filling it up with various lettuces, spinach, carrots, coriander, mint cuttings and strawberry runners. I’ve yet to fill the upper levels and the pots on the ground with the fuchsias, ferns, impatiens, lilies etc. that will eventually give the Wallgarden perennial colour and style! I look forward to seeing both edibles and ornamentals spilling over the planters, which will then disappear into the background. The system is living up to its promise of providing a good environment for our plants to grow in, but other bonuses have emerged along the way too. Access for gardeners including those with impaired mobility is much easier than in conventional in-ground gardens. With our system starting just below waist height, we can also roll a wheelbarrow under it to easily mix our growing medium, fill pots and tend to plants. This garden has a lot of growth and experimentation ahead of it but we couldn’t be happier with how it’s working so far. Most of all it brings a lot of edibles to a place where I can see them from the kitchen and check on them as I pass by several times a day – Zone 1 in Permaculture terms. And it makes our outdoor living area a lovelier place to live. The Wallgarden system will be on display at Nadja’s Garden’s open day for International Permaculture Day, Sunday 4th May, 1-4pm. For updates please see Nadja’s Garden on Facebook. 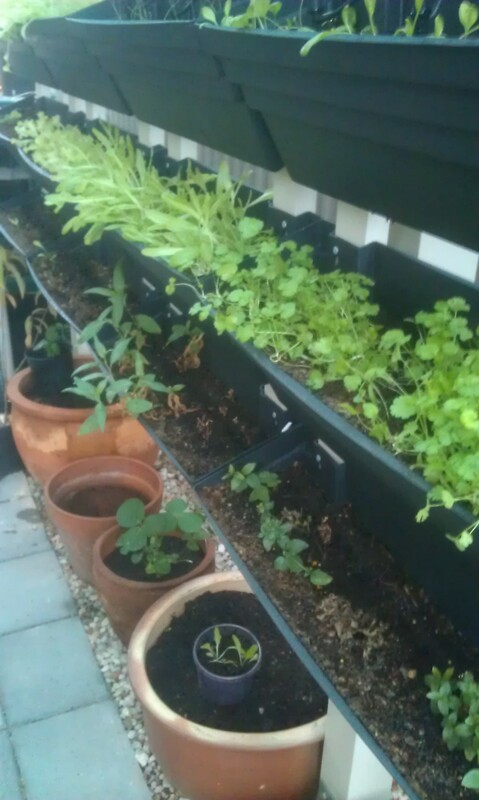 This entry was posted in hanging out in the garden, permaculture design, vertical gardens. Bookmark the permalink.